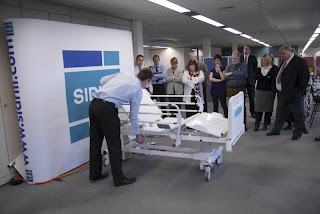 For the past year we have been developing the next generation of hospital beds for the acute and private sector - the Independence Innov8. 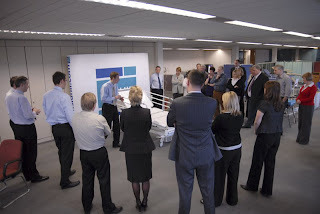 It has taken tens of 1,000s of hours of engineering time, huge amounts of analysis on computer software, and meeting after meeting planning details and options; but the most important part of all of this is when we talk to our customers about the bed. Last week we held our final focus group, where a number of helpful customers came to Sidhil to give us their opinions. 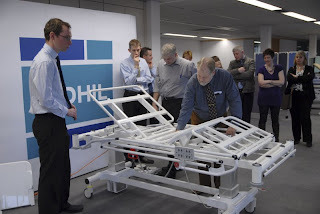 Previously, at conceptual stages, the focus group has been used to refine the basic features and function of the bed; at this late stage it is a chance for customers to see actual samples of the bed and to get their final views on specific details. By the beginning of February all the design decisions, modelling, analysis and checking was complete. The technical specs were loaded into the laser cutter and all the metalwork cut to shape. Jigs were created, and the various pieces assembled and painted. Finally, the bed itself was assembled. All was now ready for the focus group. On Wednesday 18th Feb we invited a selection of customers to Sidhil. After a brief welcome and presentation from James Ibbotson and Clive Siddall, the bed was unveiled and demonstrated by Alastair Fry. The response from the customers was fantastic - they seemed to love the bed, but also made several helpful suggestions for minor improvements. An example of these was to raise the monitor stand by about an inch to allow more room for equipment hung from the footend. One of the most fantastic moments was not directly related to the bed itself. While discussing reliability and maintainability, the group got onto the topic of Service & maintenance agreements. This is another service offered by Sidhil, and the customer from Liverpool spoke up about her experiences with us. They previously used another company who frequently let them down, and so towards the end of last year they swapped to Sidhil. Since then they have had an exemplarity service, and have enjoyed total peace of mind. In fact, the customer explained that for the first time she could have a holiday safe in the knowledge that there would be no problems or crises while she was away. Overall the event was a tremendous success, giving us a lot of reassurance that the technical team have done an excellent job creating a fantastic new product. Let’s hope that hospitals around the UK agree, and decide to buy the bed in volume. The new bed should be available for delivery to customers in April.